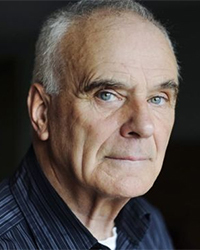 The next of my Lent Series miniatures is Unbroken Circle, a four-minute piece for alto flute, bass clarinet, viola, cello and piano by Peter Maxwell Davies. It was composed in 1984, a year that would prove to be an anguished one for Max: his mother, Hilda, had a severe stroke midway through the year (from which she would never recover, dying nearly two years later) and his father, Tom, perhaps in response to this, collapsed and died a few months later, on Christmas Eve. Unbroken Circle slightly predates these twin tragedies, receiving a private first performance on 1 June of that year (in Bath, where the work’s dedicatee, William Glock, was being awarded an honorary doctorate; the public première took place on 30 November), yet the distinct air of soft melancholy that permeates the work seems to foreshadow the events that were soon to come. A brief cello opening, apropos of nothing, recedes instantly into slow, interwoven flute and clarinet lines, resolving from a semitone clash to a major third. Joined by the strings, this simple idea is developed slightly, clarinet and cello mainly acting in a more dronal capacity, flute and violin moving more demonstratively, though still with no more urgency than a funeral procession. The entry of the piano – bass chords and high twiddling – triggers a shift in behaviour in the violin, which moves into the foreground articulating a sul ponticello melody, now with a palpable sense of pace. Normality is restored with the piano’s departure, leading to an initially tremulous slow conversation among the quartet, soon becoming much more eloquent and assertive. The piano enters a second time, muddying everything in low register contrapuntal murk, but ultimately leading to a rapid ascent that unites everyone, the quintet’s final notes hanging like droplets of water vapour in the air. In some respects, the music in Unbroken Circle is equivocal, even conflicted, but the deft way Max manoeuvres the players through degrees of light and shadow, culminating in something streaked with diffuse radiance, is involving and moving. It doesn’t only demonstrate that drama can play out in just a few minutes but also that it can unfold with a slow, almost drifting sense of momentum. This beautifully gentle performance was given by members of Birmingham Contemporary Music Group, at the same concert in March 2012 that also featured Birtwistle’s Double Hocket.